It is a rewarding experience to see my patients get back to doing things they never thought they'd be able to do again. 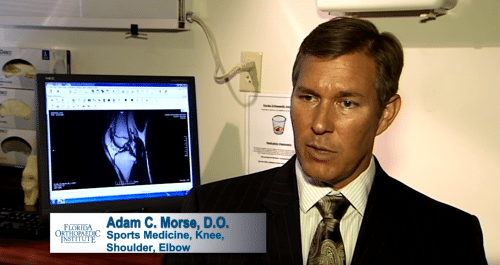 Dr. Morse has been with Florida Orthopaedic Institute since 1999. He received his Bachelors Degree in Biology from the University of Southern California in 1988. He then graduated in the top 10 percent of his medical school class from the Western University of Health Sciences in California. He completed his Internship through Ohio University, and his Orthopedic Surgical Residency through Michigan State University. He then completed a sports medicine fellowship here at Florida Orthopaedic Institute. Dr. Morse is board certified by the American Osteopathic Board of Orthopaedic Surgery, where he since acts as a clinical examiner for young surgeons seeking board certification. Dr. Morse is active in training medical students, interns, residents, and fellows interested in orthopedics and sports medicine. Dr. Morse was previously a Clinical Assistant Professor through Michigan State University. He lectures locally and nationally and teaches at surgical skills labs in advanced arthroscopic techniques. He is the president of FASMed, a non-profit collaborative organization of sports medicine providers that promotes the best practice standards for sports safety in cooperation with the Florida High School Athletics Association. Dr. Morse has served as team physician for the University of South Florida, Saint Leo University, the University of Tampa, and local area high schools. He has served as team physician on the professional level as well with the Tampa Bay Lightning, and the Tampa Bay Storm. Dr. Morse has provided medical coverage for the Outback Bowl for five years, and he also provided coverage for the state baseball finals, the Hillsborough County east vs. west High School Football All-Star games, and the Sunshine State games. Dr. Morse gave me the short term and long term diagnosis for my treatment. He was patient with me while I made my decision for my care. Thank you for your professionalism and honest diagnosis. I have been a grateful patient of Dr. Morse since 2015 and he has never disappointed me. Dr. Morse is an excellent doctor and the quality of care he provides for his patients is unparalleled. He is attentive, caring and understanding. He makes the patient feel that they are the most important person in the office. He is patient and takes the time to answer my questions. He never rushes to his next appointment and always gives me enough time. Furthermore, he always listens to my needs. Dr. Morse is very thoughtful and compassionate with his recommendations. Thank you so much for being my rock, Dr. Morse. Dr. Morse was very straight forward and took great care of me. Also, with me being young, he gave me great detail on my diagnosis which other doctors did not do. It is nice to finally have a doctor who takes the time to listen to you and explain what he needs to do. He went out of his way to help me and I can finally walk without any pain. Dr. Morse was kind and gentle. He explained everything to my understanding. I have suffered three orthopedic injuries within the last nine years with two requiring corrective surgery. Dr. Morse repaired my left rotator cuff in in 2011 and right bicep tendon in 2018. I’ve had successful outcomes with both surgeries resulting in full strength and mobility. In all phases on my care, Dr. Morse and his staff, including Millie (Administrative Assistance) and Shea (Clinical Assistant), have shown outstanding customer service. Dr. Morse is very knowledgeable, personable and easy to talk to. I would highly recommend Dr. Morse at Florida Orthopaedic Institute for all orthopedic needs. I had a very good experience. The staff was so friendly and helpful. Dr. Morse has made everything easy and he was very professional. I am 67 years old and have been under Dr. Morse’s medical care for my arthritic knees for approximately one and a half years now. I find Dr. Morse is a quite knowledgeable and caring physician. One of his endearing qualities is that he listens intently to his patients as he allows them to explain their physical conditions and their concerns of how they can heal. He offers them his full plan of treatments, one treatment at a time. Every treatment I have received from him has always resulted in less pain. Dr. Morse, hands down, by far has been the best physician to be under patient care with. He provides options for what I was dealing with, starting conservative first. He provides knowledge and tells you what to expect from your procedure. He also has a genuine care and concern for his patients and that goes a long way in my opinion. Patients are treated as patients and not just as a body and business. I’ve seen MANY Doctors in Tampa for a hip problem (I’ve even been willing to travel if necessary). Too many times I was turned away with a prescription and of course, my copay; which can add up fast!. I got so tired of being turned down that I was beginning to accept my destiny of living with chronic pain, but decided to give Dr. Morse a try. He was honestly the last doctor I would see. When I first met him, he was genuinely interested in helping me. He DID NOT offer me a prescription for pain. Instead he gave me a prescription to start various exams and physical therapy. He went through various exams to rule out and discover the direct cause for the chronic hip pain. He finally figured out the exact problem and explained it to me very specific and offered different options. He was honest, patient, specific, confidential, and above all extremely knowledgeable. In addition, he has a great personality, professional, good sense of humor and has a great passion for making people feel/function better. Words cannot express the immense gratitude my family and I have for Dr. Morse. Thanks for everything, Dr. Morse. My son sustained a hip injury while playing high school baseball. We were recommended to see Dr. Adam Morse. He ‘fit us in’ to his schedule since it was a Friday and it was suggested we not wait until Monday to be seen by a physician. Dr. Morse was outstanding! Not only did he explain the injury, but he took the time to answer every question we had. My son had many questions, as he was devastated to be injured during his sport season. However, Dr. Morse was encouraging, without making any promises. He showed him how to continue upper body training and discussed what our next steps should be. Our son went into the appointment defeated and emerged with hope. With each follow-up visit, there was progress in his recovery. Dr. Morse performed the exercises with my son and corrected him as needed, so my son would perform the exercises correctly at home. With Dr. Morse’s recommendations, my son was able to play his first game of the season this past week! We highly recommend Dr. Morse, not only for his medical knowledge, but his commitment and care to his patients. Dr. Adam Morse is a wonderful Doctor with a great bedside manner, he was also very honest and gentle…..seems to be an all around great guy. I have seen MANY doctors in Tampa for a hip problem (I have even been willing to travel if necessary). Too many times I was turned away with a prescription and of course, my copay; which can add up fast! I got so tired of being turned down that I was beginning to accept my destiny of living with chronic pain, but decided to give Dr. Morse a try. He was honestly the last doctor I would see. When I first met him, he was genuinely interested in helping me. He DID NOT offer me a prescription for pain. Instead, he gave me a prescription to start various exams and physical therapy. He went through various exams to rule out and discover the direct cause for my chronic hip pain. He finally figured out the exact problem, specifically explained it to me, and offered different options. He was honest, patient, specific, confidential, and above all, extremely knowledgeable. In addition, he has a great personality, professional, good sense of humor and has a great passion for making people feel and function better. Words cannot express the immense gratitude my family and I have for Dr. Morse. Thanks for everything my doctor, Dr. Morse. A great sport medicine doctor and an orthopedic surgeon! In March of 2015 I was referred here by my previous orthopedic surgeon since he was at a loss at how to treat me, aside from physical therapy. At just 20 years old I had just found out that the sever knee pain and issues I had been having since I was 14 were due to birth defects and deformities. FOI scheduled me with Dr. Morse and things have been getting better ever since. I expressed my desire to continue with the physical therapy I was doing and that I wanted to try everything possible before I considered surgery. Dr. Morse and his PA Dr. Hines were completely understanding and agreed with me that a non-surgical approach was a good plan. Unfortunately I still ended up needing surgery after finding the same birth defect in my other knee. Through the entire process of scheduling surgery and an insurance change a wee prior to surgery, every single person on his staff has shown that they care. I have never had a doctor that actually cares as much as Dr. Morse does. I have had to call him multiple times during on-call hours and never expected him to personally call me each time, let alone express as much concern in his voice about me when I was at a loss on how to feel better. So far I am 8 weeks post-op from my first surgery with Dr. Morse and the work is absolutely incredible. I’ll be having surgery on my other leg in the beginning of 2016 with him and although surgery is terrifying, Dr. Morse and his staff truly care about you and want to see you live up to your full potential. While the reasons why I had to come to FOI aren’t the best, I am truly so grateful to have found this Institute and a staff that is not only incredibly knowledgeable, but talented, funny and caring. In my eyes, Dr.Morse is a god send and his assistant, Katie, is the best. She helped me with forms and understanding what was going to happen. I’m happy and almost pain free from the surgery! Dr. Morse truly cares and his office is the greatest. I would recommend anyone to go to Florida Orthopeadic Institute. I’m back to my life, thank you for Dr. Morse and Katie!